Happy Bloggers Challenge Friday! Thanks to everyone who played along with last weeks color challenge, I enjoyed eveyone's take on the challenge! This weeks challenge is Floral Frenzy. Use floral paper, create your own flowers, use stamps, the possibilities are virtually endless! Using some pieces Unibind sent for their Facebook Craft Challenge, I covered them with Bo Bunny Papers and Tissue Tape, to create an Easel Frame. I created my own flowers using the Sweet William Stamps from Our Daily Bread Designs, Spellbinders Blossom 3/Foliage Dies and some Bo Bunny papers. 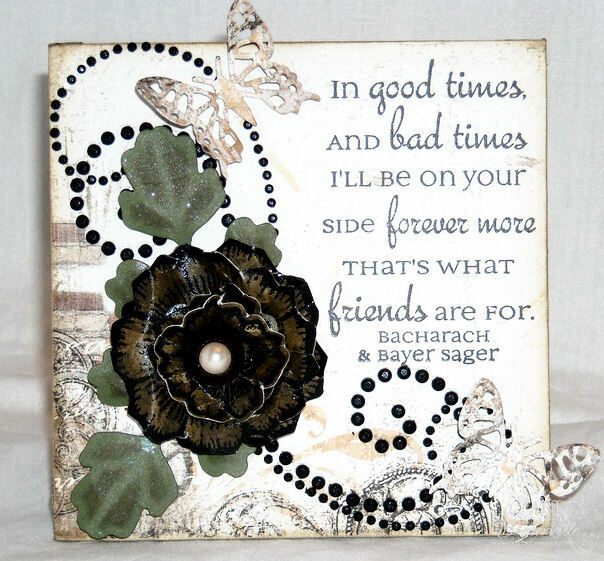 Friends is from the Blessings Collection, stamped in Black Archival. I embossed the Sweet William blossoms on the backside of the paper used to cover the Unibind piece, then scrunched and pinched them to form the blossom, adding a Websters Pages Sparkler to the center. To embellish my piece I added some leaves using Spellbinders Foliage Die, Zva Creative Flourish Pearls and Butterflies from the Exotic Butterfly Mini Die. Misting my finished piece with Pearl Glimmer Mist. If you'd like to play along with this weeks Bloggers Challenge, please link back to this post on your blog and mention you created your card for the Bloggers Challenge Floral Frenzy Challenge. Please add your link using the Link Tool below. Just a note on the link tool, your link should be a direct link to your Bloggers Challenge Post, use your name as the Title. Please do not link to cards that were created prior to the challenge date. Entries not linking properly, or backlinked will be removed. Your card is elegant and gorgeous, Lisa. Beautifully created. Love the flower and the gemstone swirls are wonderful. So stunning! When you add those swirls, it just finishes the card so beautifully! Beautiful flower card! Luv the saying GF! Lisa your card is beautifully put together, so elegant...and love that verse...I need to get that verse..
Glad to be back playing along. Beautiful flower. Elegant card. Love the flourishes. Love the sentiment. Exquisite! Beautiful design and the flower is gorgeous! What a great sentiment! Love this! Happy Friday! Wow, you definitely win that challenge in my book-this is beautiful with that sentiment and those gorgeous flowers. Such a beautiful floral creation you have made. I love the romantic look. Great job. Wow! This is a wonderful project. Stunning! Love this! Thanks for joining us at Flutter By Wed. This is so pretty. Gorgeous flower!! Wow, Lisa! This is amazing! Love everything about it! The flower, th butterflies and the flourishes.. just fab! What a wonderful way to set off that lovely saying! This would make a truly fabulous gift for a very special friend...hope you have someone special in mind! This is gorgeous!! I love that big flower and the butterflies are so pretty! Thanks for playing along with Flutter By Wednesdays! Thanks so much for joining our challenge at Little Miss Muffet and good luck! Your project is very pretty! Beautiful! Love the soft and elegant flower and flourishes. The sentiment is wonderful and I can see this as a beautiful additional to anyone's home! Lovely framed piece Lisa I love the colours and the flourish of pearls! Thanks so much, the Team and I are delighted you joined us at Simon Says Stamp and Show! Adorable easel frame and the flower is stunning. Thanks for sharing with us at Little Miss Muffet Challenges.